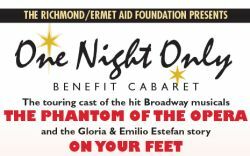 Cast members from the touring cast of the Tony Award-winning Broadway show, The Phantom of the Opera, will be joined by cast members from the touring cast of On Your Feet, the Gloria and Emilio Estafan story for an evening of music, dance and comedy in a show we're calling BROADWAY BACKWARDS -- where the boys get to sing songs traditionally done by the ladies and the ladies sing songs traditionally done by the men. This will be our biggest One Night Only benefit cabaret of the year and certainly one not to be missed. VIP tickets include the cocktail party with the cast in the main lobby following the show where you can meet and greet the cast members over Ketel One cocktails and tasty bites.